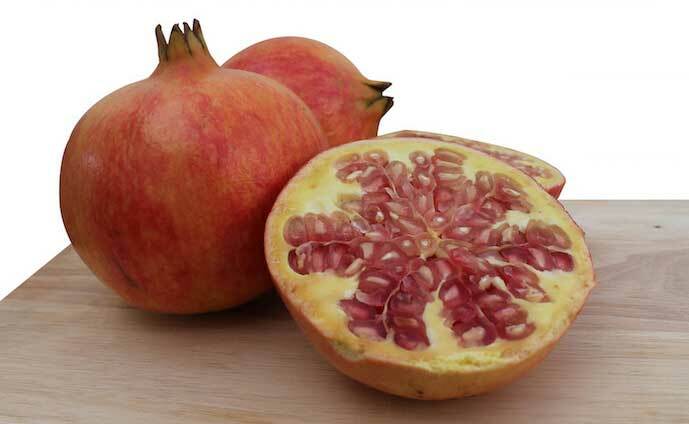 The pomegranate is a so-called ‘super fruit’ for its many healthy properties. The pomegranate is rich in polyphenols, known for its powerful antioxidant, it is a low calorie fruit and has astringent and anti-inflammatory properties, which is ideal for cleansing and slimming diets. The antioxidant power of pomegranates, three times higher than red wine or green tea, protects cells from damage caused by oxidative stress and slows the aging process. In addition, recent studies have shown that consumption of pomegranate helps reduce cholesterol levels in the human body and pomegranate juice can delay the onset of Alzheimer’s disease. The pomegranate also helps prevent heart disease, heart attacks and helps prevent certain cancers such as breast and prostate. Pomegranate is also referred to as natural Viagra. In fact, pomegranate juice can have positive results on the quality of sperm and erectile dysfunction. The pomegranate prevents fluid retention, helps fight hypertension, arteriosclerosis, excess uric acid and intestinal parasites. It is an ideal low-calorie food for slimming diets; and in addition it is recommended to prevent the discomfort of menopause and also it has good diuretic and cleansing properties.